We were absolutely AMAZED at the effect that fermented foods have had on our well being. Yes indeed, it is life changing. We struggled every winter from October through February with sickness upon sickness. Each illness significantly worse than the previous as our weaken immune systems had no time to recover. A sweet friend told me to make sauerkraut. My initial response? YUCK! She persisted in sharing with me the wisdom behind the reasoning. In my desperation, I drove two hours to visit the Mountain People Organics at the Farmory Co-op where she spent the day teaching my children about this old family recipe. This is the thing I noticed the most when I taught others about cultured foods – when they consumed one of these foods they would get better, but when they consumed all three, they seemed to thrive! These three foods (kefir, kombucha, and cultured vegetables) are unique unto themselves and each food contains a different set of bacteria and yeasts that we need to thrive and feel alive. We have enjoyed kombucha for years now. It helps remove toxins through the kidney, liver, and the bowels. You might notice, as I did, that kombucha can help you lose a lot of excess water weight. It helps you eliminate the excess swelling and fluid that accumulates in your tissues from chemically laden foods and alcohol. Kombucha is a liver cleanser and it will assist your liver in removing toxins that have accumulated. Kombucha will also help relieve the water retention that often happens when the body protects the organs by holding on to water when under stress or a heavy toxic load. Honestly, we are still refining the art of brewing our own. You can learn how to do that here. Sometimes life gets busy and our consumption out paces our brewing so there are some weeks it easier it is to pick up a bottle at our local market Cliff's Market in Caldwell or even at our favorite grocery store Fred Meyer. Keifer is the next regular to add to our diet. Homemade kefir has 50 plus good bacteria and yeasts. It is so powerful that I recommend people consume only small amounts when they first start kefir, so as not to overwhelm their body with good bacteria. These bacteria are strong and will go to work killing pathogens and bad bacteria, making some individuals uncomfortable. You can read more about that on this blog post: The Healing Crisis. 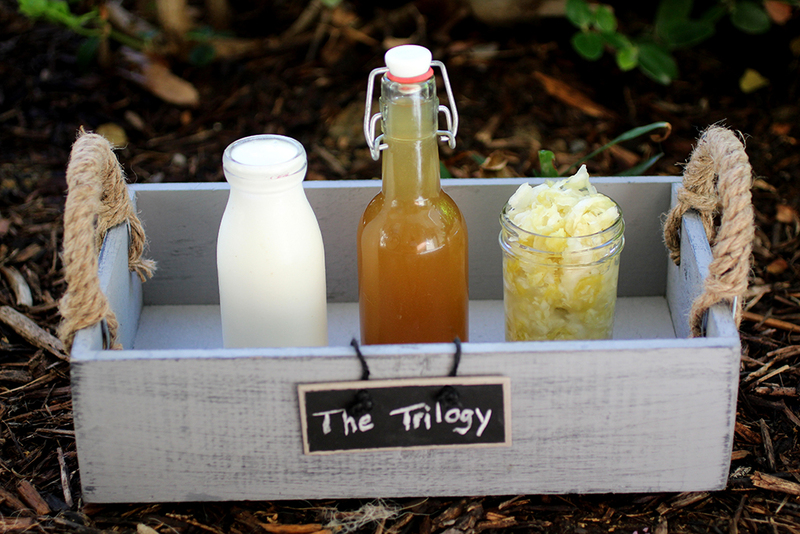 Kefir and its special bacteria will make you its home and keep things in balance for you. It will add probiotics to any kind of milk, whether it be cow, goat, coconut, or almond milk.It will transform the milk, increasing vitamins and nutrient absorption, and it will do this sitting on your counter in a glass jar while you go about your day. Then when you consume it, you will find it will digest your food, reduce inflammation, make elimination a breeze, and, well, the list is so long it would take this entire page to explain it all. Is it hard to make? NOPE! Miste Karlfeldt, our executive director of Health Freedom Idaho, has a wonderful easy to follow tutorial on making keifer at home. Our new year goal is to master the perfect trifecta!